Soup makers have been the must-have kitchen gadget in UK homes over recent years – and their popularity shows no signs of slowing. They allow you to whip up healthy soups in no time at all, with minimal fuss, and using far fewer pots and pans than making the soup manually yourself. Not only are home made soups far tastier than anything you can buy in a tin, making them at home also gives us complete control over the ingredients used. Soup makers are also quite versatile and many can be used to make other nutritious meals such as smoothies and even the not so healthy items like compote and chocolate fondant pudding. Yes! Cold blended recipes (milkshakes, smoothies) Plus it can steam vegetables & boil eggs! 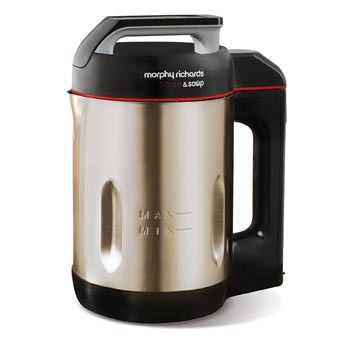 You could call the Morphy Richards 501020 Total Control the King of dedicated soup makers. It is a superbly well-designed gadget which addresses all of the niggles that come with some of the mid-range makers. It isn’t the cheapest soup maker out there and, if paying a little more doesn’t dissuade you, this impressive soup maker packs some great features. What makes the Total Control different? One of the first things you’ll notice about the 501020 Total Control are the controls. They are not only set out differently when compared to earlier models like the 501014 or 48822, there are also more of them too. To begin with there are 3 different settings for making soup – compared to two available on many other soup makers. You can prepare smooth, medium and chunky soups. This gives you more automated control over how the soup is prepared. In fact, it is one of the reasons this device is called Total Control. It provides a hands-off way to prepare home-made soup to any preference. Secondly you can also use the manual blend function after the soup is prepared. This will allow you to blend in more of the remaining chunks if you prefer your soup a bit smoother. On the control panel you’ll also find a saute mode. Once activated this causes the base of the unit to heat up and act as a small frying pan. Allowing you to brown off small quantities of ingredients to make the base of your soup, such as onions or larden. This nifty feature allows you to pack in as much as flavour as possible without the need for using separate pans. It helps save on the washing up! As we would expect the Total Control also features a drinks mode – just like some of Morphy Richards earlier models. 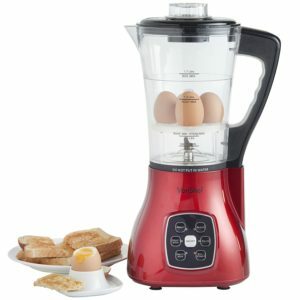 This will allow you to make use of the blender to prepare healthy smoothies and creamy milkshakes. A nice touch which increases the usefulness of this device a bit more. What else can the Total Control do? Lastly there are two settings which we do not expect to see which caught our eye. The first is the reheat function. If your soup goes cold or you want to reheat some soup you had earlier a few button presses will set the device to run the appropriately timed heating cycle to automatically reheat your soup. The second is a pre-clean function. Filling the jug with 800ml of water, a dash of washing up liquid and selecting the pre-clean mode is all you’ll need to do to clean the worst of the soup left overs from inside the jug. Despite some clever advertising by Morphy Richards this isn’t a complete cleaning solution and you will still need to give it a quick rinse and wipe around afterwards. But, it still does most of the work for you. Yes! 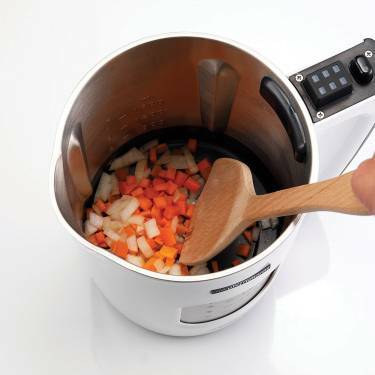 The Total Control can be used to prepare soup for 2,3 or 4 people automatically. Typically most other devices can prepare soup for a fixed amount of people. To use this feature fill the device to one of the 3 fill lines and set the portion size. The Total Control will automatically adjust the heating and blending times accordingly. This is yet another feature which will be welcomed by both kitchen newcomers and seasoned enthusiasts because it takes just a little bit more work out of preparing your soup. If you’re looking for the ultimate dedicated soup maker which is centred around pure convenience and ease of use the Total Control should not disappoint. The only caveat is the cost. But, you’d be hard-pressed to find a better soup maker and this one certainly has the reviews to back it up. From being a cost-effective meal and helping dieters reach their goals faster, to offering great nutritional value and nursing the sick back to health, the benefits of soup are many. But, with today’s busy lifestyles, who has the time to chop a bunch of vegetables or stand over a pot for long stretches of time just to whoop up some soup? Well, with the Duronic Soup Maker BL91 at hand, you will not have to go through so much hassle. And, when not making soup, this appliance doubles up as a blender/smoothie maker. Sounds like a product that will find a place in your kitchen? If so, read our review below to find out more about this versatile appliance. 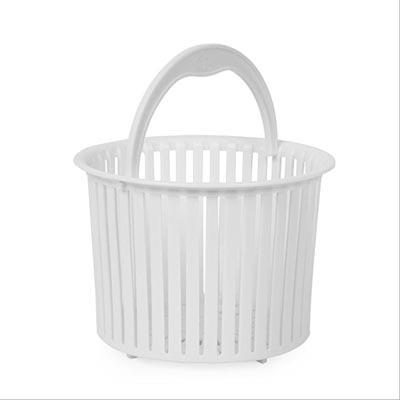 The steamer basket even allows you to steam vegetables using the BL91! The BL91 comes in two parts – a powered glass jug and base with pre-programmed buttons that offer a range of functions. Its preset functions include smooth and chunky soup as well as steam/boil, pulse, blend, juice, sauce and ice. Before you begin using this unit, you have to plug it into the mains power supply and hit the ON/OFF button. Thanks to the automated functions, the Duronic BL91 takes ease-of-use to a whole new level. All you need to do when making soup is just drop in your clean chopped veggies and other ingredients into the jug, pour in some water or stock, turn the appliance on, press one of the automated soup preset buttons, and the BL91 will take care of the rest. What’s more, you can make smoothies, crush ice cubes and puree cooking ingredients at the push of a button. Keep in mind though that the motor will not run until the lid is properly secured onto the jug. If you do not secure the lid properly or if it becomes loose, the soup maker sounds an alert and this can even disrupt a soup making or blending cycle. Simply make sure that the handle and ‘lock open’ symbol on the lid are in alignment to avoid any problems. Whatever cooking method you choose, this soup maker works impressively fast and delivers piping hot soup in 20 to 30 minutes. What’s even better is that the soup tastes great as the unit actually prepares soup step-by-step like a person would. For example, when using the smooth soup mode, the Duronic BL91 begins by first heating up the ingredients before bringing them to a rolling boil 5 minutes into the process. Boiling continues for another 5 minutes after which the blender automatically kicks in at around 10 minutes and turns everything into a smooth soup in a few seconds. The soup boils for another 8 or so minutes and then alternates between blend and boil until the soup is fully ready. At this point, the machine beeps before turning off. Throughout the process, a digital display right above the function buttons on the base unit shows you the current temperature and how long the soup has been cooking. If you are one of those people who love cooking but hate it when its time to clean up, you will find the BL91 to be your kind of appliance! It does not make any mess when cooking and leaves you with little cleaning work. A soft damp cloth is all you need to wipe the base unit’s surface. For the lid, simply rinse it with warm soapy water and dry before storage. The detachable jug is made of glass, which means it is very easy to clean because soup (and anything else you make) will not stick to the sides. Duronic also goes a step further and provides cleaning accessories (a scourer & brush) for even easier cleaning. Should you find yourself in a hurry, there is another option for quick cleaning. Simply add warm water to the jug and hit the pulse or blend button and the jug will clean itself. For a thorough clean, wipe the jug’s inner walls with a sponge and dish detergent before finally rinsing it. Just make sure to be careful since the sharp blades attached to the jug’s base are not removable. When it comes to versatility, the BL91 soup maker easily surpasses many products in the market. We can even go as far as to say it one of the most versatile kitchen appliances. It not only makes delicious soup but can also deliver smoothies, milkshakes, and juices. And, that’s not all that this unit can do. It comes with an optional steaming basket, which you can use to make steamed vegetables and also boil eggs. Another feature that is worth noting is the jug’s holding capacity. With a full capacity of 1.7L, the jug can make around 1.2 litres of soup. So, you can easily make drinks and dishes for 3 to 5 people in one go. The only downside we found with this unit is that it is quite large and heavy. But, that is only because it has a solid build. Rubber feet attached to the base keep this unit stable when in use while the glass jug is strong and hard to break. With its 1000W blending power and 800-900W heat output capacity, this appliance is pretty powerful. As far as quality is concerned, this machine delivers, which makes it a great addition to any kitchen where homemade soup is a regularly cooked entree. 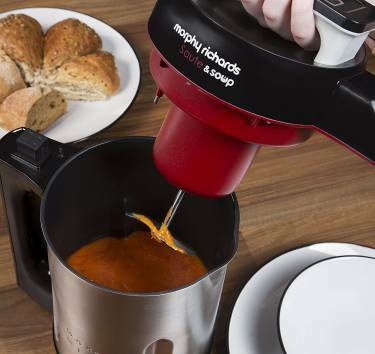 Following in the long line of dedicated soup makers made by Morphy Richards the 501014 provides everything you need to make soup quickly and easily in one handy device. It builds on previous models released by Morphy Richards, such as the ever-popular 48822, by reconfiguring the layout of the controls and handles. This, according to Morphy Richards, makes it easier to use and select blending programs. This certainly seems to be the case because you can setup this unit in seconds with nothing more than a few button presses. The saute function is similarly easy to operate and is located on the left-hand side handle. Press this once and the bottom of the jug will begin to heat and will be ready to use within around 1 minute. What can you use the saute function for? Using the saute function you can brown small amounts of meat (such as bacon) and the bases for your soup, like onion and garlic. This feature allows you to cook your entire soup from start to finish in one device. The first is that you can’t use it to replace your saucepan entirely. If your soup requires more than around 100g of meat you will need to cook this separately first. The second is that you should can only use this function for 5-10 minutes. In fact, Morphy Richards explicitly states that you should not use it for longer than 10 minutes. Most soups generally don’t require much meat (if any) and the saute function is more than adequate for most soup recipes. That said, it is a point worth remembering if you do have a penchant for meat-heavy soups. Once your base is ready you can add your ingredients and make your soup! There are two main soup settings: chunky and smooth. If you want chunky soup chop your ingredients into small pieces and place those into the jug. The device will then only heat the soup without activating the blades. Making smooth soup is exactly the same process except the device will activate the blades to make silky smooth soup. The 501014 is also very speedy and it can make smooth soup in 21 minutes and chunky in 28. All of this is prepared in its very ample 1.6 litre jug, which produces enough soup to serve 4 people. What else can the 501014 do? Like most modern tech available today the 501014 soup maker is a multi-function gadget and provides several other useful functions. The first is that it provides an auto pause mode if the lid is lifted during the cooking process. The blade also stops spinning for safety. You can then add additional ingredients or seasoning if you’re prone to missing the odd thing out (as I am) when you begin cooking. Replacing the lid will cause the device to automatically restart and it will finish preparing the soup. The second is that it provides a manual blend function. This is particularly useful if you have made chunky soup but then decide you’d like it a bit less chunky! You can manually blend the soup until it reaches your desired consistency. Lastly you can make healthy smoothies or indulgent milkshakes by using the ‘blend’ function. This activates the blades but not heat the contents. There are a couple more things worth knowing about the 501014. The first is cleaning – a job none of us particularly enjoy. Whilst the 501014 isn’t dishwasher safe it is certainly very easy to clean. A quick rinse out with some water and then a wipe down with a soft soapy sponge is all that is required to clean the jug. The interior is also non-stick to help make cleaning as easy as possible. The second is longevity. So many gadgets, like phones, seem designed to last only a short-while before failing. So its good to see that the 501014 comes backed with a 2 year guarantee (at the time of this review). It also features specially designed serrator blades which can last up to 12 times longer than conventional blades. And, sharp blades means your soup maker can continue to make smooth soups, smoothies and milkshakes for years to come. Not only that but these blades have been independently tested to the International Cutting Test System ISO 8442.5 – so you can be sure this is not just marketing waffle. Overall the Morphy Richards 501014 is an excellent value soup maker. It can prepare more than just humble soups, has a saute function to help lock extra flavour and comes backed with an impressive 2 year guarantee. 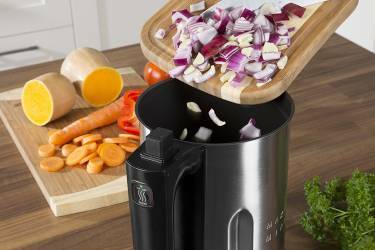 Not only that but it comes in at around only £10 more than its predecessor, making it definitely worth a look if you want a soup maker which provides great functionality without breaking the bank. The Tefal BL841140 Easy Soup personifies simple use. Whilst it can make other food and drinks it is clear the design of this appliance has been laser targeted to provide a simple way to prepare soups with minimal fuss. This becomes apparent when you first see its rather basic control panel. 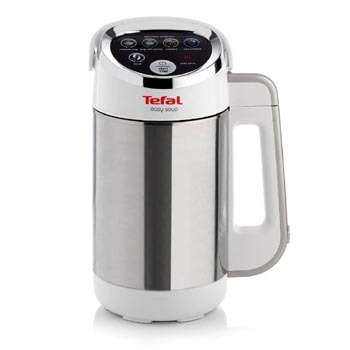 It provides a limited function set, allowing you to make smooth (or ‘creamy’ as Tefal refers to it) soup, chunky soup, compote or access a blend mode. It provides none of the further functionality you might find on other devices such as adjusting the temperature or cooking times. Whilst the lack of features may put some people off, it is clear the Tefal Easy Soup is ideal for anyone who wants a simple, one-function device. One which is both easy to use right out of the box and has none of the extra complications that other features introduce. Start by selecting what type of soup you want to make by pressing either the ‘creamy’ or ‘chunky’ buttons and then press the start button. The Easy Soup will beep once and start the cooking cycle. 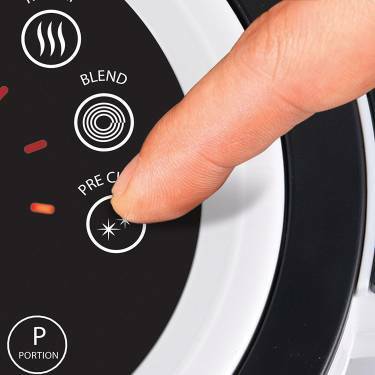 Because the heating and blending times are pre-programmed the device knows what to do and when, for a completely hands off cooking experience. For example, when preparing creamy soup the device will blend the mixture a total of 5 times for 20 seconds each time. The only downside to this ‘set’ program is that you do not get the flexibility of extending cooking time if, for example, you want tougher vegetables to cook for a bit longer to soften them. Lastly you can access the compote function and manual blend. The compote mode is a nice touch we did not expect to see. This works in a similar manner to preparing soup except the cooking and blending times have been adjusted to prepare fruit. The blending cycle is also fixed in its operation time and pressing the button once will cause it to run for 4 minutes. There are a few more things worth knowing about the Tefal Easy Soup. The first is that it features an auto-warm cycle which kicks in automatically after preparing soup. It will keep your soup toasty hot for up to 40 minutes. Which is very handy if you’re serving for family and friends and someone wants another helping. The second is that, like some other devices, you can interrupt the cooking cycle part way. The down side is that it won’t auto-restart. Which means you can’t add ingredients or extra seasoning mid cycle. In fact, Tefal suggests that you should wait 20 minutes after interrupting the cooking and then restart it all over again. This is bit of a disappointment since other appliances can be interrupted without this drawback. Lastly it arrives with a free recipe book featuring around 30 different recipes for you to try. These vary from regular soups to cool summer soups and even chocolate fondant pudding. It is a very comprehensive and worthwhile addition which is sure to come in handy right away. Fortunately the Easy Soup does include an automated cleaning program. Filling the device with 1.2 litres of water (but no washing up liquid) and pressing the ‘easy cleaning’ button is all you need to do. Once it has finished empty away the contents and give it a quick rinse and you’re done. The Tefal Easy Soup is certainly something of a mixed bag. It does lack in features when compared to other devices but includes useful additions such as the keep warm function and free recipe book to help bridge the gap between some of its shortcomings. If you want something you can literally pull out of the box and start using instantly, without navigating through an instruction book, the Easy Soup shouldn’t disappoint. This makes it one of the most straightforward to use devices we’ve reviewed. Plus, with a reduction of features comes a reduction in price – it is marginally cheaper than some made by other brands. 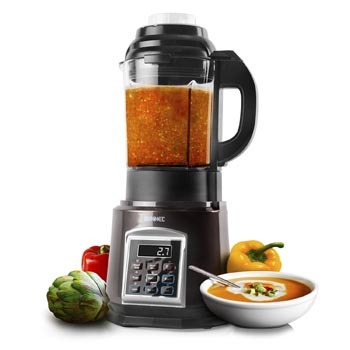 Just like most soup makers the EK1548 can prepare chunky and smooth soups as well as other cold blended foods. The time it takes to prepare the soup is also about the norm for a device of this type, and it takes around 30 minutes for chunky and 20-25 minutes for smooth soup. Using the device is very simple. All you need to do is place your ingredients into the jug, secure the lid and you’re good to go. The only downside with the EK1548’s simplicity is that there are no other options for reheating, changing the cooking times or for sauteing your base ingredients. Some owners have reported a problem that some of the ingredients get stuck to the bottom of the jug. This is clearly a known problem and to counter this Salter recommends place a small amount of oil in the base of the unit to prevent this happening. It is not a huge problem, but it is worth knowing if you settle on this appliance. 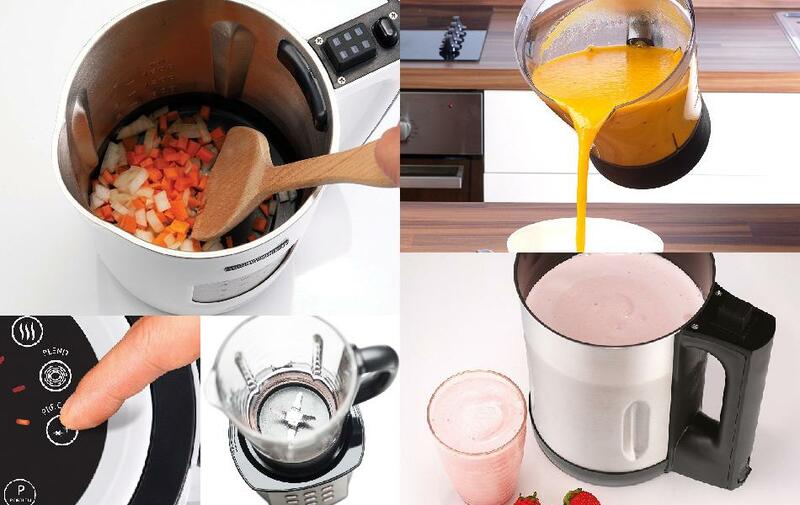 Just like most soup makers you can make other food and drinks using the EK1548. In fact you can make anything from the usual smoothies and milkshakes to dips and dressings. This is all achieved using the blend cycle. To access this you’ll need to press the ‘mode’ button 3 times and press and hold the on/off button. When you release the on/off button the blending will stop. Most other soup makers offer a timed blending program, often lasting a few minutes. But we prefer the manually controlled blender provided on the EK1548. It gives you complete control over how thick your dips are or if you want to blend your chunky soups a little bit more without blitzing them. The first is an overfill sensor in the jug. If activated the appliance will refuse to operate. You need to be a bit careful because if this gets wet it will activate even if you haven’t overfilled the device. Luckily a quick wipe of the sensor is all that is required to get it working again. The second is a thermostat which switches the unit off if it gets too hot. This is particularly useful if your soup doesn’t have enough liquid in and begins to burn. Or, if little hands manage to switch on the device whilst it is empty. When either of the sensors are activated the unit emits an audible alarm to let you know something is wrong. If you’ve read any of our other reviews above you might have already guessed the EK1548 has an automated cleaning function. In this case the blend mode also doubles up as the cleaning program. Instead of blending ingredients, clean water is ‘blended’ and removes any residue from the sides. You’ll also find a handy cleaning brush included in the box which makes reaching the bottom of the jug easy, should you need to scrub out the odd bit of stuck on food or marks. The EK1548 is certainly very simple and doesn’t offer the level of customisation or control you’ll find on other units. 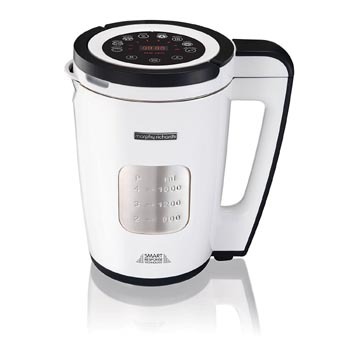 However, its robust stainless steel jug, safety features and ample 1.6 litre jug make it the ideal family soup maker. Plus its slightly lower price point (when compared to other models) make it ideal if you want a no frills device to make your soup with the minimal fuss. With more than 20-years industry experience, Salter is a well-established British household name and one of the top brands in the UK kitchen appliances market. Products that bear the Salter brand name often deliver when it comes to quality. 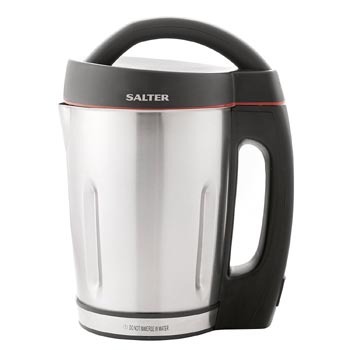 Therefore, if you are shopping for a soup maker, you won’t be disappointed with one from Salter. There are actually a few good picks to choose from, including the EK1548 Salter soup maker that was featured on ITV’s ‘This Morning’ television programme. However, today we’ll focus on the 1.5 litre EK2401 Salter soup maker, which comes with a transparent jug and no automatic presets. This is a major shift from the stainless steel jugs and automated functions that have become standard features of other Salter soup makers in this line. Despite requiring a bit of manual operation, the EK2401 gives users more control when making soup or smoothies. We’ll take a closer look at what it has to offer in the following full detailed review, which can assist you to make an informed buying decision. Using the EK2401 Salter soup maker is quite simple but first, you have to assemble the unit. Placing a silicone mat under the base unit is advisable so as to protect your kitchen countertop from the heat it emits. The detachable jug goes on top of the base unit but you have to make sure that the locking tabs on both parts align or else the soup maker might stop abruptly during use. The EK2401 blades are detachable for easy cleaning. Unlike the Duronic BL91 Soup Maker that we reviewed above, this Salter soup making machine has a removable blade. After inserting the multipurpose blade into a spindle found on the jug’s base, the soup making process can begin. For the best consistency in your soups, it is best to chop solid ingredients into about 1/2 inch pieces. Once you have your ingredients ready, add them along with water or any preferred stock into the jug. Fill marks indicated on the jug make it easy to know just how much ingredients you should add. It is important to note that this appliance won’t run if the lid is not properly secured. We find this feature quite handy since it prevents unnecessary spills as your broth boils during the cooking cycle. Closing the lid involves rotating it in a clockwise direction. The lid clicks to let you know it is securely in place. As with most electric soup makers, the Salter EK2401 has a heating element on the base that heats up ingredients. A dial on the base unit lets you set the cooking duration, which can range from 15 to 60 minutes. Once the time is set, the soup maker starts to heat up ingredients automatically. The only caveat we found on this soup maker is that you have to press and hold the ‘blend’ button to stir up ingredients. This can be done half-way through the cooking cycle or as desired. Knowing when to blend your soup is made easier since the transparent jug lets you keep an eye on what’s cooking. A blue light on the handle’s base lights up to indicate that the cooking cycle is still ongoing. The heating element goes off once the timer counts down to zero. The blade still rotates even after the cooking cycle has ended. All you have to do is press the blend button to get that perfect soup consistency before serving. If you want to create something that does not require heating, avoid turning the timer dial after adding ingredients. Simply press and hold the blend button when making smoothies or milkshakes until the desired consistency is reached. There are no dishwasher safe parts on the EK2401 Salter soup maker, but hand washing this unit is relatively easy. Its detachable metal blade and lid rinse easily under running tap water while the base unit just requires a simple wipe with a soft damp cloth. Make sure though to unplug the base unit’s power cord from the socket during clean up. Rinsing the transparent jug immediately after serving soup makes it easy to wash off food debris before it can dry and stick on the inner walls. Alternatively, you can add warm soapy water just above the minimum fill line and press down the blend button while the blade is still attached. This can help to dislodge loosely stuck food particles from the jug’s walls. However, leaving warm soapy water in the jug for some time makes it easy to scrub off burn bits. 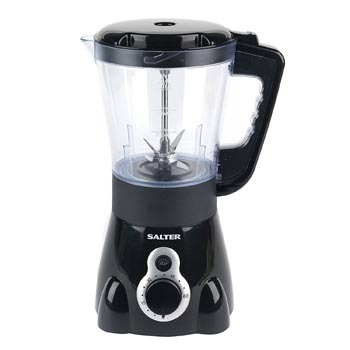 If you want a soup maker that switches itself off but lets you choose when to stir up ingredients for that perfect chunky consistency, then the Salter E2401 is for you. Users who prefer soup/smoothie makers with one-time setup should look into other fully automated models but the EK2401 Salter soup maker strikes a good balance between automation and precision cooking. Overall, this unit offers good value for the price given its generous 1.5 litre capacity, easy to clean design and free recipe booklet. These are the most common kind of soup maker available. 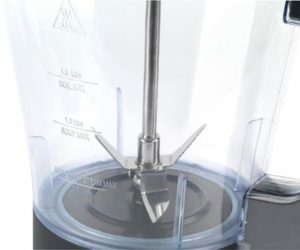 The blending blades are attached to the lid and lowered into the jug where a heated base plate cooks the ingredients. On average it takes around 20 – 30 minutes to prepare your soup – depending on whether you selected smooth or chunky soup, with chunky taking the longest to cook. They are very simple to clean and some come with a non-stick interior and require little more than a rinse and quick wipe. Most also allow you to prepare smoothies and milkshakes and have a specific function for blending cold drinks. These units double as soup maker and traditional blender in one device. They typically offer more functions when compared to a kettle style soup maker and can take the place of several kitchen appliances. Many can not only prepare soups but also a variety of cold drinks and some can even be used to steam eggs. The blades are usually fixed into the base of a glass jug and use a heating element or the heat generated by the rotating blades to cook your soup. Because the glass jug is transparent you can see inside as cooking is taking place and the jugs can be easily detached for serving. What should you look for when buying a soup maker? Knowing what to look for before you buy anything can save you time, hassle and money. With this in mind we’ve put together the key points we think you should know, and consider, before you buy. Some soup makers can even boil eggs! If space is at a premium in your kitchen it might be worth taking advantage of the versatility offered by soup makers. Begin by deciding what extra features might be useful to you. For example, many can make smoothies in addition to soups – great if you want to get in your 5 a day and will use this function often. Some even double as blenders and can be used to crush ice and make cocktails. By taking a few minutes to consider what you may need you might find that a soup maker can take the place of up to 3 or 4 appliances in your kitchen. Some soup makers allow you to lightly fry ingredients directly in the jug. This not only saves on washing up, but also adds flavour to the sauce, because the juices and browning created during the frying is automatically deglazed into the stock. Generally speaking a jug size of around 1.6 – 1.7 litres (which is fairly common) will feed around 4-6 people – depending on portion sizes. Whereas a jug size of 1 litre or under is reserved for single meals or 2 small portions. These are guidelines of course but they should help you decide on a unit which is able to cater to your needs. 4 How much should you spend? As with most small appliances of this type, such as halogen ovens, air fryers and milk frothers, you can pay as much or as little as you want. Typically you can buy a decent soup maker from anywhere between £40 – £80. Although some premium units can cost well over £100. If you want something which can whip up anything from cocktails to sauces and purees, or crush ice in addition to preparing soup you may be better off with a soup making blender. Whilst these can sometimes be the more expensive kind you can find some bargain units around the £40 mark such as the VonShef Multifunction. Soup makers are, surprisingly, one of the most versatile gadgets you can buy for the kitchen. Just like air fryers and halogen ovens their use versatility makes them incredibly popular. Not only that but their ability to allow us all to enjoy healthier meals at home whenever we want, without any hassle, is in part why we all want one in our kitchens. But, if you’re still unsure which soup maker might be right for you we recommend taking another look at our soup maker comparison table. It shows those which offer a perfect balance between price and functionality – from entry models to high end units. There should be something to suit every budget and need.